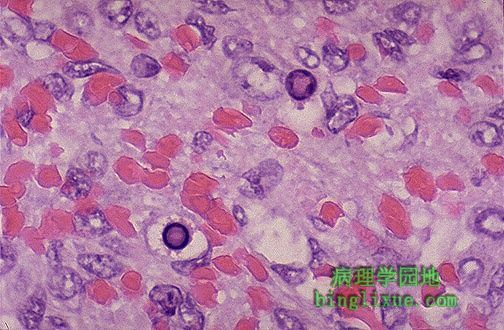 The pink intranuclear inclusions in the erythroid precursors seen here are characteristic for parvovirus infection. Parvovirus, or "fifth disease" is a self-limited infection that can produce a "slapped cheek" appearance of a rash in children, and often goes unnoticed in adults. However, pregnant mothers can pass the virus to the fetus, and a severe anemia with fetal hydrops and intrauterine demise can result. Scattered giant cells with a scant mononuclear interstitial infiltrate are seen. 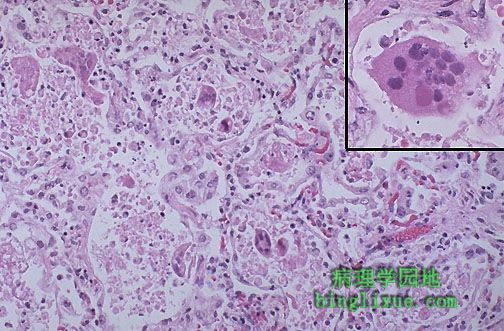 The pink, rounded intracytoplasmic inclusion in the giant cell of the inset at the upper right is typically seen with respiratory syncytial virus (RSV), a common cause for pneumonia in infants and children under 2 years of age. This is a ball of Ascaris lumbricoides worms removed from the colon of an adult. This is a heavy infection. 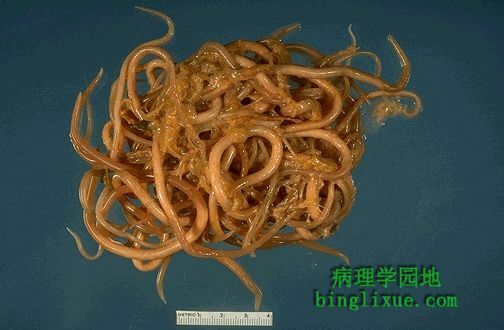 Though these worms are disgusting, they produce minimal disease in most infected persons. This colonic mucosal surface is erythematous because of the enormous infestation by Trichuris organisms (whipworms). Here are microfilaria. 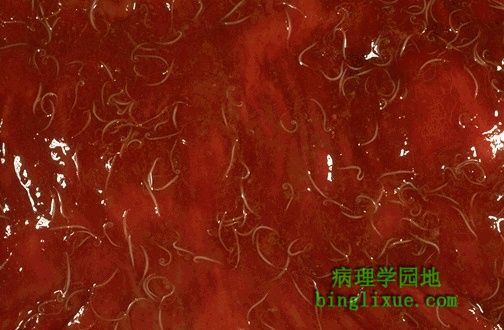 These tiny worms circulate in the bloodstream. There are several species with slightly different clinical characteristics, but they are spread by mosquitos. 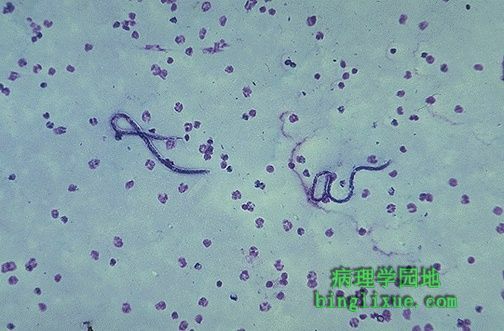 These microfilaria happen to be Wuchereria bancrofti. This peripheral blood smear comes from a patient with malaria. This infection happens to be with Plasmodium vivax. At the arrow on the left is a RBC with a malarial parasite in the shape of a ring. 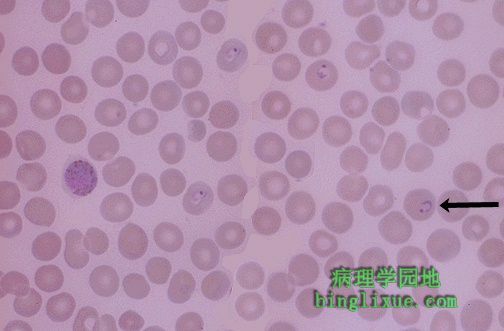 Three other RBC's in this smear are also infected with a ring trophozoite. At the far left is a gametocyte of this species. 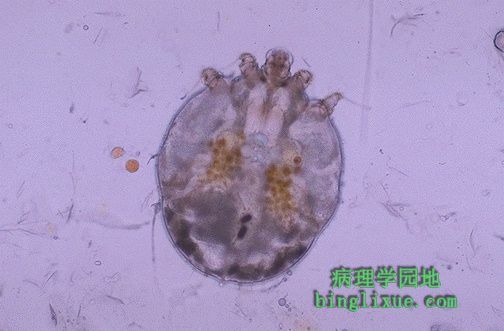 This is a scabies mite. The official name is Sarcoptes scabiei. These little critters burrow in the epidermis, usually on the hands but sometimes elsewhere, and produce itching along the linear burrows. These lesions are often excoriated because of the itching. 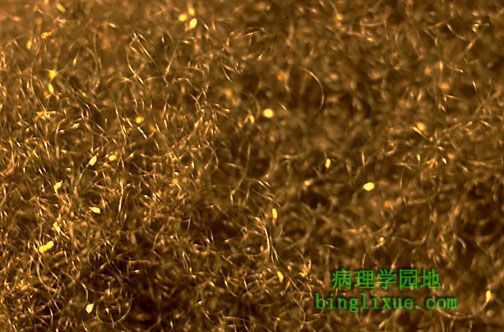 Small tan sesame seed-sized lice are seen scattered amongst the hairs of the head. Head lice are relatively common, particularly among children, and can cause itching, sometimes to the point of excoriation with risk for secondary infection. The lice and their eggs can easily be passed from one person to another with close contact or from sharing combs, towels, etc. Lice are arthropods of the class Insecta which generally inhabit hair and bite the human host for a blood meal. 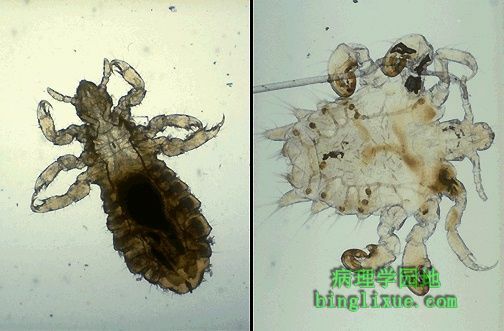 At the left is the head louse (Pediculus humanis capitis) and at the right is the crab (pubic) louse (Phthirus pubis).